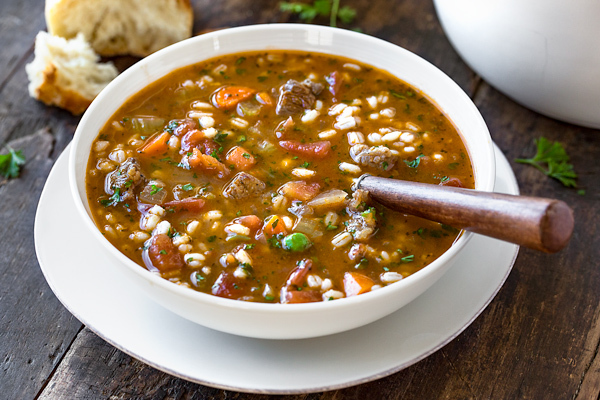 Little is more comforting than a hot, hearty bowl of beef barley soup filled with lots of fresh vegetables—you can taste the love in every spoonful! Years and years ago, back when I was just a wee kid, there were a series of commercials for a brand of soup that claimed one could eat their soup with both a spoon and a fork. The slogan they used was, “The soup that eats like a meal”, and boy did they make their soups look appealing to a young kid’s eyes! And they used to show a spot for a beef barley soup, one filled with loads of bright, vibrant vegetables and big pieces of beef ladled into bowls; and because I’ve always been a big fan of beef barley soup, it looked so appealing to me! I implored my mom to buy a can for me the next time she went to the store. 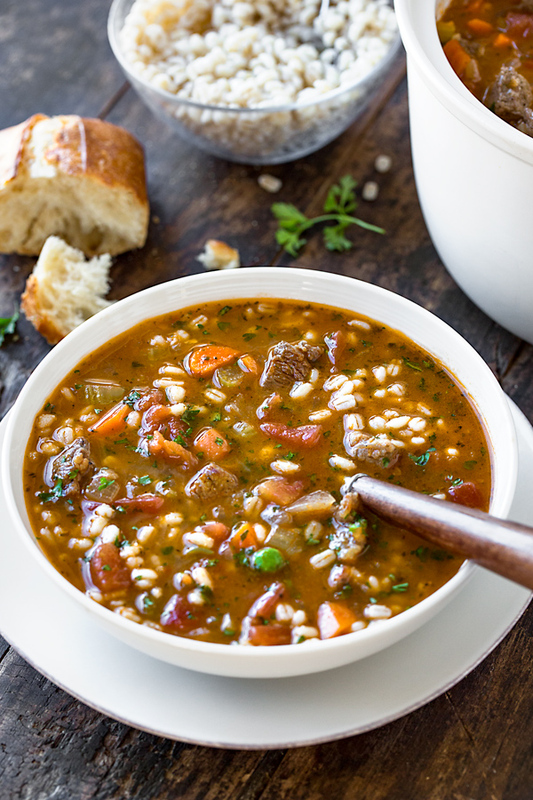 I just had to have a big bowl of this beef barley soup to try for myself. And my mom being a sweetheart, she obliged (never mind that she was an expert at preparing her own homemade beef soup) so that her silly daughter could try this canned version. So I got out my can opener, carefully removed the tin lid, got out a small sauce pan, and dumped the contents into the pan. Upon examining the soup, I noticed how highly glossy it was, which was sort of strange. Mom’s was never glossy like this…but OK. I figured it would still probably taste great! To my budding little palate, this beef barley soup had the strangest consistency and flavor, with that mouth-coating slickness at the forefront, and the “meat” being a little odd in texture too. Sadly, it was not what I had expected—it even looked completely different as it slid out of the can! This became one of my early experiences tasting the difference between processed food and homemade food, which was prepared with real ingredients and of course, love. But this experience actually did me a favor, because it helped me to develop a deeper taste and appreciation for homemade food. It also planted a little desire in me to one day develop my own recipe for what I think a truly hearty, rich, aromatic, and delicious beef barley soup should be, one definitely worthy of making a meal out of! The kind of beef you choose to use for beef barley soup is up to you. One really great option that isn’t very expensive is beef stew meat; but that cut of beef takes longer to cook, typically about 2 hours of simmering for a nice, tender result. I personally have often prepared my beef barley soup with stew meat when that’s what I have on hand. But if I’m looking for a bit more “beefy” flavor, more richness and more tenderness, then I opt to go a slightly more pricey route and use rib eye steak. Rib eye has an amazingly beefy flavor; and because it is meant to be cooked quickly rather than for an extended period, the chunks of steak only require a quick sear/browning before being removed from the pot, only to be added back in at the end to finish in the hot broth. 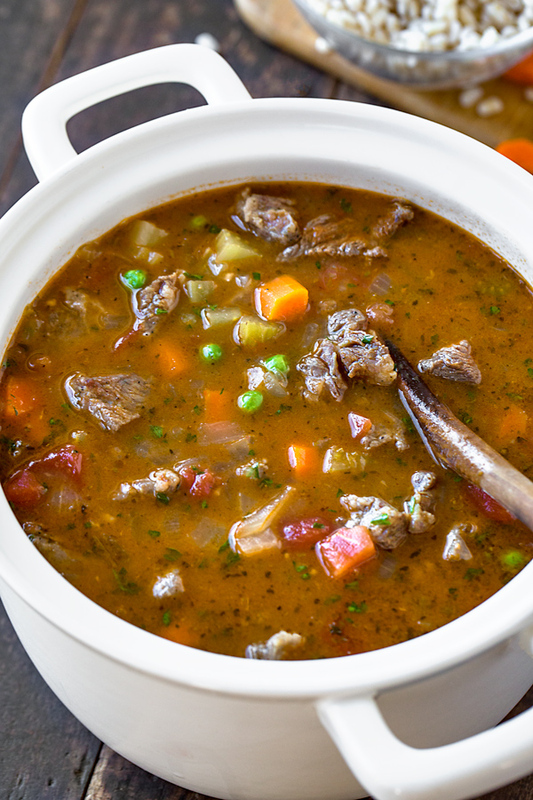 I use rib eye in this delicious Steak and Ale Soup recipe, and it makes for a richer end result because of its marbling of fat—lots of great flavor in that! And for the sake of my recipe here, I’m using the rib eye steak, because again, I love the flavor of it. And because this is one of my personal favorite soups, I’m willing to splurge for it. I begin by cooking the barley (as per package instructions) in a separate pot, so that it cooks while I prepare my soup. I like to keep it separate so it doesn’t absorb all that delicious broth! While the barley cooks, I cube up my rib eye steak, and prep all of my veggies and other ingredients. I prepare the meat by tossing it in some flour to coat and with some salt and pepper to season. In a medium-large soup pot, I heat some butter and oil, and sear my beef for a few minutes on all sides until browned; I remove it with a slotted spoon and set it aside. To that same pot I add my vegetables and seasoning, sautéing for a few minutes until slightly softened; then, I add in my garlic and tomato paste, and stir those in. Next, I add a touch more flour to my vegetables; and while whisking vigorously, I add in my beef broth followed by my diced tomatoes, and bring it all to a simmer. Once it’s simmering steadily, I reduce the heat and cover the pot, and simmer for about 15 minutes more. When the vegetables are tender, I turn off the heat and add the browned beef back in, and allow the soup to sit for about 5 minutes, allowing the beef to warm through and cook a little more, ever so slightly, in the residual heat before adding in some herbs as finishing touch. To serve, I add the cooked barley to my bowl, ladle the hot soup over, and enjoy! Cut of beef: As I mentioned, for this recipe I chose to use rib eye steak cut into cubes, because of the richness and flavor. It is more expensive, but well worth it. It is also quick-cooking, so that helps too. You could also use beef stew meat—just know that after you brown it you’ll leave it in the pot and add in the other ingredients; and you’ll need to simmer the soup for about 2 hours until the meat is tender. Vegetables: I love the basics in this beef barley soup: carrots, onions, celery and green peas! Since there’s barley being added, I leave out potatoes, though you can add those in if you like as well. You can also substitute parsnips, cubed butternut squash, leeks, rutabaga or turnips—I’ve used them all! Gluten-free option to replace flour: I use flour to coat my cubed rib eye before browning it, and a touch more in the soup to provide a bit more body; but you can substitute corn starch, or even potato starch, for a gluten-free option. And if you are going gluten-free, you’ll of course want to leave out the barley. 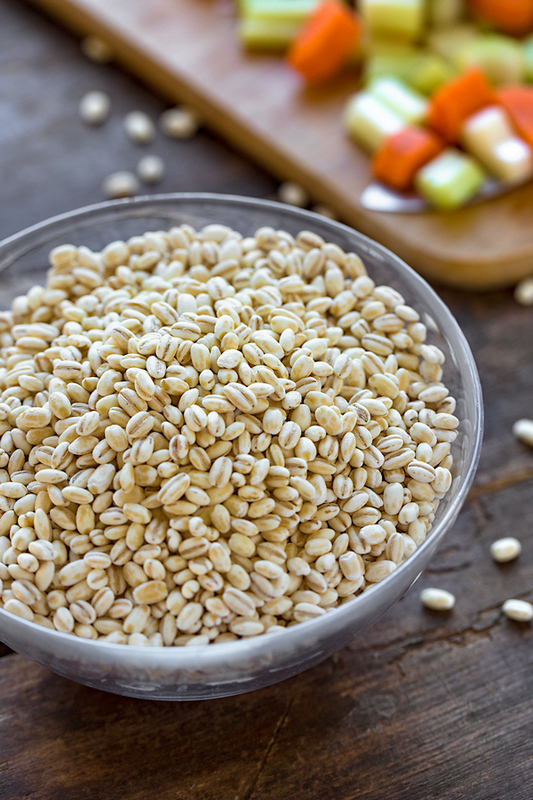 Cook the barley separately: I’ve found that anytime I add barley, quinoa, pasta, or even rice directly into my soup pot, when preparing a soup that calls for any of these, they end up absorbing too much of the liquid over time, and the soup becomes super thick! I like to keep my soup broth-y, so I cook my barley separately (and keep it separate), and simply add it to my bowl before ladling in the hot soup. 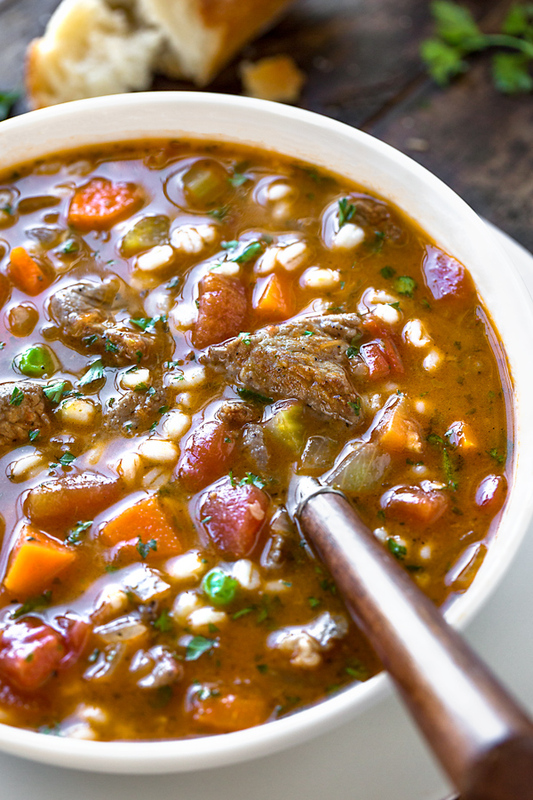 This comforting beef barley soup, filled with lots of vegetables, is the perfect meal—it’s deliciously cozy and hearty! -Begin by preparing your barley according to package instructions; set aside once cooked. -While the barley cooks, prepare the soup: place the cubed rib eye into a medium bowl, and sprinkle with a couple of good pinches of salt and pepper; sprinkle over 2 tablespoons of the flour, and toss to coat. -To the same pot, add in the diced onion, carrots and celery, and stir to saute for 2-3 minutes, scraping up the brown bits on the bottom of pan for flavor; add in the Italian seasoning and the garlic, and stir until aromatic. -Add in the tomato paste and stir to combine, followed by the remaining 2 tablespoons of flour, stirring that in as well. -Add the beef broth, whisking all the while to keep the soup smooth, then add in the diced tomatoes. -Bring the soup to a vigorous simmer, then cover and reduce the heat and allow the soup to simmer gently for 15 minutes, or until the veggies are tender. -Turn off the heat, and add back into the pot the seared beef along with any juices, plus the peas and the parsley; allow the soup to sit for about 5 minutes to allow the beef to gently heat through and finish cooking to medium-rare. -To serve, add about 1/2 cup cooked barley to individual bowls, ladle hot soup over top, and enjoy! Hungry for more soup recipes? Check out this Harvest Stew with Smoked Sausage, this Hearty Italian Chicken and Autumn Veggie Soup, and this White Bean Soup with Spicy Chorizo! I cannot wait to try this recipe. I love a good hearty soup and this one looks like it will warm my soul! Thank you for posting such great recipes. I have tried many of them and have loved them all. And thank you for such a kind comment—I am thrilled you have been enjoying our recipes, and appreciate you saying so. Hi Sue, perfect timing, indeed! Could this soup be made in the slow cooker? Caitlin, that’s wonderful! So glad to read that! Your tweaks were perfect, and I’m sure delicious. The leftovers should be even more flavorful for you after the soup’s had a chance to sit—hope you both enjoy it again! Loving your recipes! Tried the beaf barley soup and it was very good! I didn’t add the parsley though. Hi Jason, so very happy to read that! Glad you enjoyed the soup, and you ask about the parsley—it does add both flavor and color. Parsley is a more subtle herb, but it has a bit of fresh “green” flavor to it, yet is still fairly neutral. Happy cooking Jason! 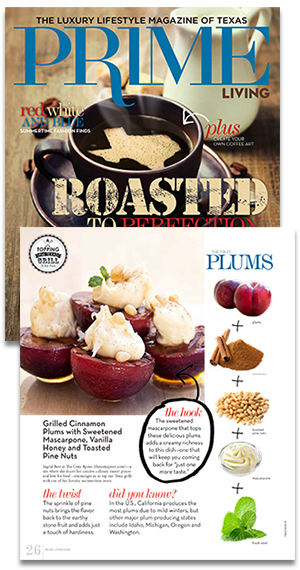 Hope you enjoy more of our recipes. I just made it and it’s delicious. Thank you so much! Hi Gloria, that’s wonderful! 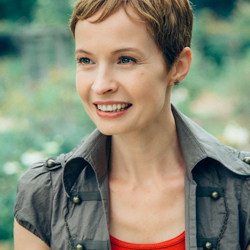 Thanks so much for taking a few moments to share your experience with the recipe with me!